Staff and residents have been celebrating after Birkenhead Court in Merseyside became Anchor’s sixth Outstanding care home. 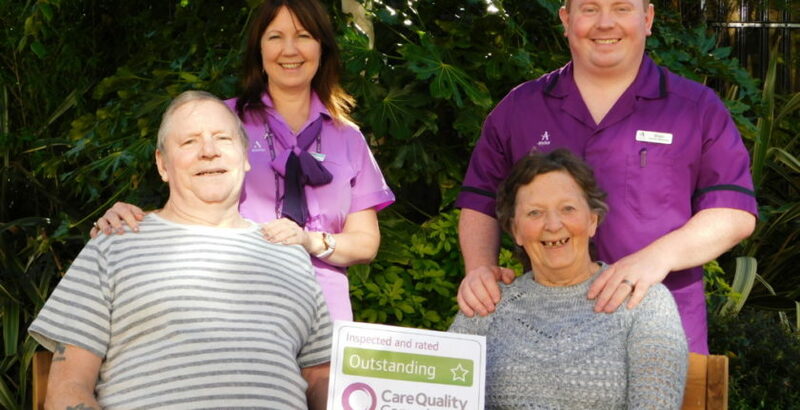 The achievement, which comes shortly after Mill View in Bradford achieved the CQC’s top rating, means Anchor has the most Outstanding rated homes for the elderly amongst the top 12 largest care organisations in the country. Home Manager Mary Hardy said: “We all know Anchor’s Birkenhead Court is a great place for older people to live but to be given such praise from the regulator is outstanding. “We secured this rating because of consistent good practice, focusing on person-centred care and putting the wellbeing of the residents at the heart of everything we do and every decision we make. “The team here are exceptional. They are passionate about providing top quality care for the residents, and their training helps them achieve great things every day. “Teamwork is key to our success. The home operates as one happy family and as no agency staff are used, we have a strong team who really know our residents. Alongside providing top quality care, the home was commended for having its own pub, sweet shop, which is used for reminiscence sessions, cinema, library and indoor garden, all of which were created by Caretaker Paul Todd. Resident Roger Nelson, who has lived at Anchor’s Birkenhead Court since 2008, said: “I enjoy living here because the staff do so much for me and make me feel valued. Nothing is too much trouble. They are a fabulous team, always smiling and helpful. “There are lots of interesting activities, days out and I love the food. If I don’t like something, they cook me something different.